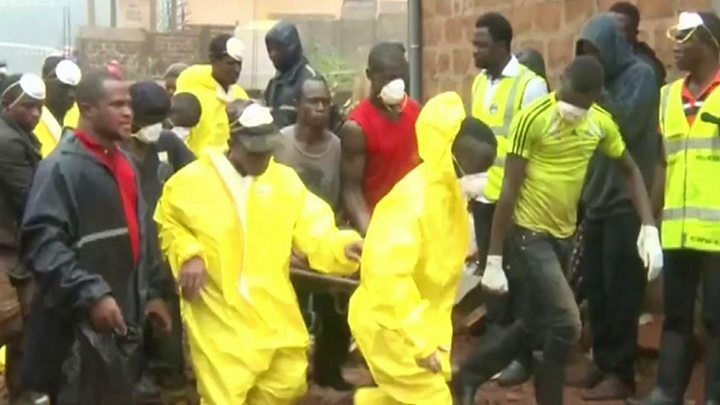 At least 600 people are still missing following a mudslide and flooding that devastated parts of Sierra Leone's capital, Freetown, a spokesman for the president has told the BBC. President Ernest Bai Koroma has declared seven days of mourning while pleading for "urgent support". 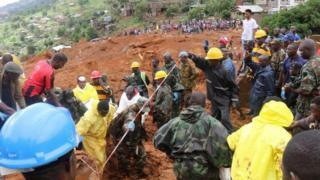 Nearly 400 people are confirmed dead after a mudslide in the Regent area and floods elsewhere in Freetown on Monday. The Red Cross has warned it is a race against time to find survivors. Presidential spokesman Abdulai Baraytay told the BBC that bodies were still being pulled from the mud and rubble. However, a planned a mass burial of victims on Wednesday to free up space in mortuaries has been delayed, the BBC has learned. The BBC's Martin Patience, who is in Freetown, said workers there say they have been overwhelmed by the scale of this disaster. He described the rescue effort so far as "chaotic". Abu Bakarr Tarawallie, a Red Cross official, said rescuers were "racing against time, more flooding and the risk of disease to help these affected communities survive and cope with their loss". The British International Development Secretary Priti Patel said the UK already had "pre-positioned vital aid supplies" in Sierra Leone, while the United Nations said its local teams had mobilised and were supporting rescue efforts. "Contingency plans are being put in place to mitigate any potential outbreak of waterborne diseases such as cholera, typhoid and diarrhoea," UN spokesman Stephane Dujarric said. The scene at Connaught mortuary was gut-wrenching. Bodies were lying on the floor because the mortuary had run out of space. There were hundreds of them, and I lost count of the number. Expect more raw emotions when families go to identify the corpses. My own emotions have reached a crescendo and I am finding it hard to sleep. While at the scene of the disaster, even though the sun shone brightly, I was drenched in tears to the point that I went to the washroom. The emergency workers thought it was for reasons of hygiene, but it was to wash away my tears. Officially, a rescue operation is under way, but it is more like a recovery operation. Only corpses are being retrieved, and ambulances are taking them to the over-crowded mortuary. Meanwhile, the community is still coming to terms with the scale of the horror. 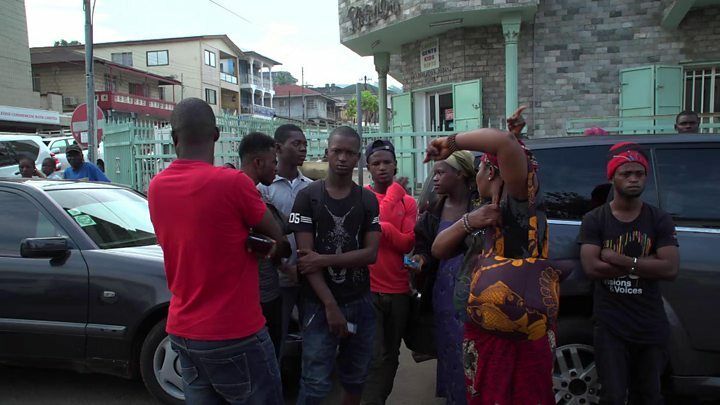 Ben Munson, who works for the charity Street Child in Freetown, said the stories he was hearing on the ground were "horrific". "One lady who our Street Child team was working with was inconsolable," he told the BBC. "She had injuries on her arms and her face and she was eating the food that we were handing out, but wasn't able to speak. "My team later managed to sort of calm her down and she explained her story, and she was pulled out of the rubble after the disaster had happened and unfortunately she had lost all of her children and her husband." Homes in the hilltop community of Regent were engulfed after part of Sugar Loaf mountain collapsed following heavy rain early on Monday. Many victims were asleep in bed when disaster struck. President Koroma fought back tears as he toured Regent on Tuesday and said the devastation was "overwhelming us". "Entire communities have been wiped out. We need urgent support now," he said. He urged people to stay away from the affected areas. "This tragedy of great magnitude has once again challenged us to come together, to stand by each other and to help one another," he said. Flooding is not unusual in Sierra Leone, where unsafe housing in makeshift settlements can be swept away by heavy rains. The rains often hit areas in and around Freetown, an overcrowded coastal city of more than one million people.